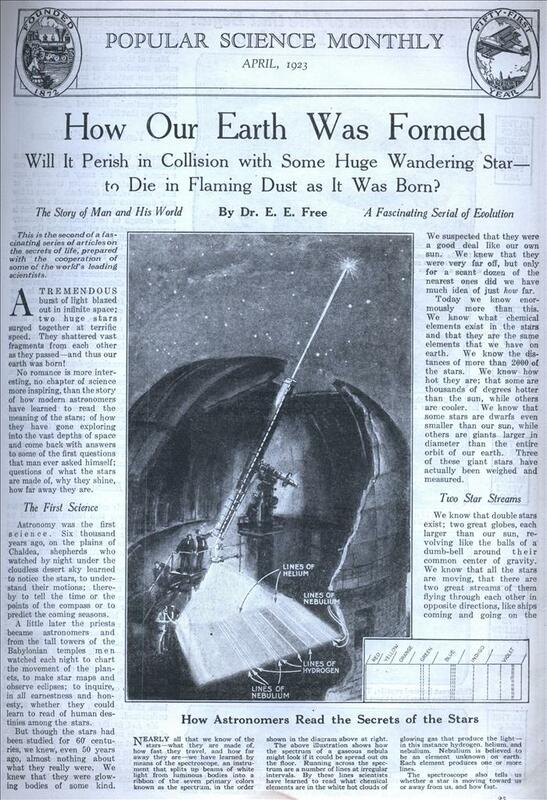 Will It Perish in Collision with Some Huge Wandering Star— to Die in Flaming Dust as It Was Born? The Story of Man and His World By Dr. E. E. Free A Fascinating Serial of Evolution This is the second of a fascinating series of articles on the secrets of life, prepared with the cooperation of some of the world’s leading scientists. A TREMENDOUS burst of light blazed out in infinite space; two huge stars surged together at terrific speed. They shattered vast fragments from each other as they passed—and thus our earth was born! No romance is more interesting, no chapter of science more inspiring, than the story of how modern astronomers have learned to read the meaning of the stars; of how they have gone exploring into the vast depths of space and come back with answers to some of the first questions that man ever asked himself; questions of what the stars are made of, why they shine, how far away they are. The First Science Astronomy was the first science. Six thousand years ago, on the plains of Chaldea, shepherds who watched by night under the cloudless desert sky learned to notice the stars, to understand their motions; thereby to tell the time or the points of the compass or to predict the coming seasons. A little later the priests became astronomers and from the tall towers of the Babylonian temples men watched each night to chart the movement of the planets, to make star maps and observe eclipses; to inquire, in all earnestness and honesty, whether they could learn to read of human destinies among the stars. But though the stars had been studied for 60 centuries, we knew, even 50 years ago, almost nothing about what they really were. We knew that they were glowing bodies of some kind. We suspected that they were a good deal like our own sun. We knew that they were very far off, but only for a scant dozen of the nearest ones did we have much idea of just how far. Today we know enormously more than this. We know what chemical elements exist in the stars and that they are the same elements that we have on earth. We know the distances of more than 2000 of the stars. We know how hot they are; that some are thousands of degrees hotter than the sun, while others are cooler. We know that some stars are dwarfs even smaller than our sun, while others are giants larger in diameter than the entire * orbit of our earth. Three of these giant stars have actually been weighed and measured. Two Star Streams We know that double stars exist; two great globes, each larger than our sun, revolving like the balls of a” dumb-bell around their common center of gravity. We know that all the stars are moving, that there are two great streams of them flying through each other in opposite directions, like ships coming and going on the sea. We even know something of the shape and size of the star cloud made up of these two streams, the cloud that includes all the stars we see and which is, for us, the visible universe. Most of this tremendous increase in scientific knowledge has been due to an entirely new method of investigation, to an instrument called the spectroscope, which analyzes the light of the stars and tells us what particular kinds of glowing matter produced that light. A Yardstick for the Heavens Another use of the spectroscope is as a celestial yardstick. By its help we can measure how far away the stars are; whether a star is moving toward us or away from us, and how fast. Some of the star distances thus discovered are astonishing. Even the nearest star, one that is close enough to be measured by ordinary surveying methods without using the spectroscope at all, is 26 trillion miles from the earth. For the more distant stars—the ones measured recently by the newer methods—miles become altogether meaningless and astronomers use the light-year, which is the distance that light, moving at 186,000 miles a second, will travel in one year. The farthest stars yet measured are 220,000 of these light-years from us. The visible universe, the cloud of stars that we see and of which our sun is one, is believed to cover the astonishing distance of at least 300,000 light-years from side to side. These figures simply demolish the human imagination. Think of the distance from us to the sun. For a,man, that is a tremendous distance. An airplane flying night and day at 200 miles an hour would need a little over 52 years to make the trip. Yet this 52-year journey to the sun is only about one fourteen billionth of the distance to the farthest known star; about the same as the thickness of a sheet of paper in comparison with the distance from New York to San Francisco. Two Billion Known Stars And in this astonishing depth of space there are over two billion stars that we know about; one star for every man, woman and child now alive in the world, and enough stars left over so that everybody in the United States could have three or four extra. Probably there are a vastly larger number of stars that we do not know about because they are too small or because they are dark and send no light to us. Billions on billions of stars, most of them larger than our sun; no one knows how many billions more of planets and earths and moons, of star clusters and of nebulae, all of them inside a space so vast that the nearest of them are trillions of miles apart—this is what we know of the universe. And man, crawling around on his one small dust mote of an earth, has been able to stretch out the fingers of his mind through all this swarm of other worlds; has been able to weigh and measure and to understand. No fact in the universe, no achievement of man, is more truly wonderful than this. Now let us look back into time instead of out into space. How did this earth of ours, so tiny but so all-important to life, come to be formed? I T^he earth was once, we believe, a part of the sun. It was pulled out of the sun, ] billions of years ago, by an encounter with a passing star. The sun is a star; one of the two billion odd stars that we know. It is not fixed at a certain point in space. On the contrary, it is moving about 13 miles every second, carrying us and all the planets with it. The other stars move too. All of them drift about in space like flying gnats in a great room. When Drifting Suns Came Together The sun has been drifting about in that way for a very long time. It was once larger than now, and hotter. It had no family of planets as it has today. It was merely an unencumbered single star drifting about aimlessly by itself. And then, one day, eight or ten billion years ago, another one of these drifting stars happened to come too close to our sun. Perhaps it came within a few billion miles; close enough, anyway, that the attraction of gravity between it and the sun grew to be dangerously large. This attraction pulled out of the half-fluid sun a lot of drops of matter, much as the gravity of the earth will pull drops of water out of a wetted sponge if you hold it up. The other star moved on. It left behind a somewhat damaged sun; a sun surrounded by a great revolving cloud of lumps of matter that had been pulled out of it. Gradually these lumps gathered into larger lumps. These are the planets. The earth is one of them. This is the modern idea of how the earth was formed. Our globe grew, you perceive, gradually; lump by lump, as the bits of matter that had been pulled out from the sun were picked up. Already six billion or eight billion years ago the earth had grown to about its present shape and size. It- is reasonably certain that the earth at first was very hot, hot enough to be molten all the way through. Its surface was a sea of melted rock in which great flaming tides hundreds of feet high raced twice daily around the globe. Gradually the rock grew cooler. It hardened. After awhile there was a solid surface crust. And slowly, after many millions of years, this crust grew cool enough for water to collect in hollows on it and to stay there. The first oceans were formed. Then ended the astronomical part of earth history; then the geological part began. With the first seas and what went on in them we come to the part of the story of the world that we can read in the record of the rocks. The rocks under our feet, the rocks that make up the accessible crust of the earth, are in separate layers, piled one on top of each other like a pile of blankets in a store. Geologists call these layers strata. Earthquakes and volcanic eruptions, other convulsions of the earth, have twisted and torn these strata. Layers that were once deep down in the earth have been tilted up so that they are exposed on the surface where geologists can get at them for study. And so, gradually, we have learned a good deal about what they are, about which layers are on top and which underneath, all over the earth. We have learned, too, how these rock layers were made. There is no doubt that they were formed in water; that most of them were produced in about the same way that rocks are still being formed on the bottom of the ocean close to the shore —by the slow hardening of loose sands and clays carried down by rivers into the sea. How Earth Strata Were Formed Very few rivers are entirely clear. There is always a little sediment, as you can prove for yourself by allowing a little of the water of the Mississippi, for example, to stand a day or so in a glass. This sediment goes out to sea with the water. More sediment, the sandier part of it, washes out along the bottom of the river. All of it, when it gets to the sea, falls to the bottom. There it gradually hardens. It is slowly changed into rock, into sandstone or slate or, with the addition of chemically formed lime, into limestone. Now and then a fish dies and its bones sink to the bottom. Occasionally a shellfish or a tree trunk or the bones of some land animal, wash out and are buried by the mud. These make the fossils. Millions of years later the fossils and the sediment together, raised above the sea by some movement of the earth’s crust, will make a rock layer for future geologists to study. Thus were formed the strata of the earth. Sometimes rock was formed near the shore, so that we can see in it the footprints of some great reptile that ventured out one day, millions of years ago, onto a muddy beach while the tide was low. Sometimes we find layers of coal where the rank vegetation of some seashore marsh gathered for ages and was buried. Altogether there are at least 55 miles of strata, for that is about the total thickness of the rock layers that geologists have identified and mapped. How much time does this involve? How long did it take for these 55 miles of rock to accumulate, sand grain on sand grain, in the sea? Until very recently geologists were not sure. The rate at which the sediment accumulates is irregular. It depends on the speed of the rivers from year to year and age to age. The age of rocks in years cannot be determined merely from how deep they lie in the pile of strata. The problem seemed to be insoluble until the discovery of radium gave us the key to the puzzle. The extraordinary thing about radium is that its atoms are explosive. A certain percentage of them explodes every minute. They leave behind them certain other elements, especially lead. Accordingly, if you find some radium in a rock, or, better still, if you find some of another element— uranium—the atoms of which explode more slowly, and if you also find some lead, you can conclude that the lead has been formed from the radium or from the uranium. Determine the exact amounts of uranium and of lead and you can calculate how long this has been going on—that is, how long it has been since that rock was formed. This has now been done for many samples of rock from all of the various rock layers. We have learned the ages of all the different strata in the pile. The oldest ones, at the bottom, have the astounding age of about 1,600,000,000 years! We are not sure, of course, that they are exactly 1,600,000,000 years old. The radium clock is not quite so accurate as that. But we are sure that it was a very long time; a time to be measured, at the very least, in hundreds of millions of years. And even this immense age is only the age of the oldest rocks. The earth itself is far older. Before rocks could be formed at all, the primeval earth had to finish its growth, had to become cool enough to hold a liquid sea, had to shrink enough to form ocean basins and thus to raise land above the waters. How many billions of years it took for the earth to get this far in its development, no one knows. It is almost two billion years since the formation of the first rocks; it is perhaps six billion more since the birth of the world. Who knows how many more billions for the previous history of the sun? This is our astonishing vista of the past. Quite as incomprehensible, it is, as the quintillion miles of known space. In comparison with even two billion years, the whole history of America since Columbus is no longer than eight minutes out of a human lifetime! So much for our vista backward. Can we look forward too? Can science return at last to the ancient effort of the first astrologers and learn to read the future from the stars ? Is our earth destined to perish in a stellar collision, to die as it was born in the flaming cataclysm of two stars that chance to come too close together? Perhaps it is, but such a flaming doom is far from imminent. The nearest star is some 26 trillions of miles away. For the sun to go so far will take over 60,000 years. Even this is far too short, for we are not moving in this direction and even the more distant stars toward which we are moving are moving also. Long before we get there, they will be gone. Other stars, of course, will have moved in to take their places. Perhaps one of these is destined to hit us; but space is wide and the chance is small. I have compared the stars in space to gnats flying about in a room. If the gnats are as far away from each other, on the average, as the stars are, there will be about seven gnats in a room two miles square. You can imagine that there will be small chance for two gnats accidentally to bump into each other. Probably life’s record in the future will be even longer than its record in the past. And what is this record of life’s past? That is the story we are telling in this serial; the story last month, of how life began; the story, next month, of how man arose out of the lower creatures. When Life Began When the earth was fully formed and had grown cool enough for life, when the ocean was ready, when there were rocks and a seashore and an atmosphere clear enough for the sun to shine through, then life began. We find its traces in the oldest rocks, the ones at the very bottom of the” pile of geologic strata. A little higher in the pile we find more complicated creatures —worms and shellfish and the curious buglike trilobites, who dominated the seas for perhaps 200,000,000 years. But was life to go on forever in the seas where it had begun? Was the land never to be conquered by higher forms of life? Was man himself never to emerge as the masterpiece of evolution among innumerable land dwelling animals? These questions would not have been answered as they have been but for the blind efforts of a curious race of fishes, which, in the next article, we see striving to perfect their bodies so that they could conquer a new realm for life. We see how they struggled generation after generation, age after age, to learn to breathe air instead of water; and how Nature finally conspired with them to perfect one of the most revolutionary inventions of all time— the invention of the lungs. Next month Man’s Animal Ancestors; His Family Tree—another thrilling story in this amazing series! Simply and understandably, Doctor Free will tell the most absorbing mystery and most fascinating romance of science—life and its conquest of the world. His story is big, vital and interesting. 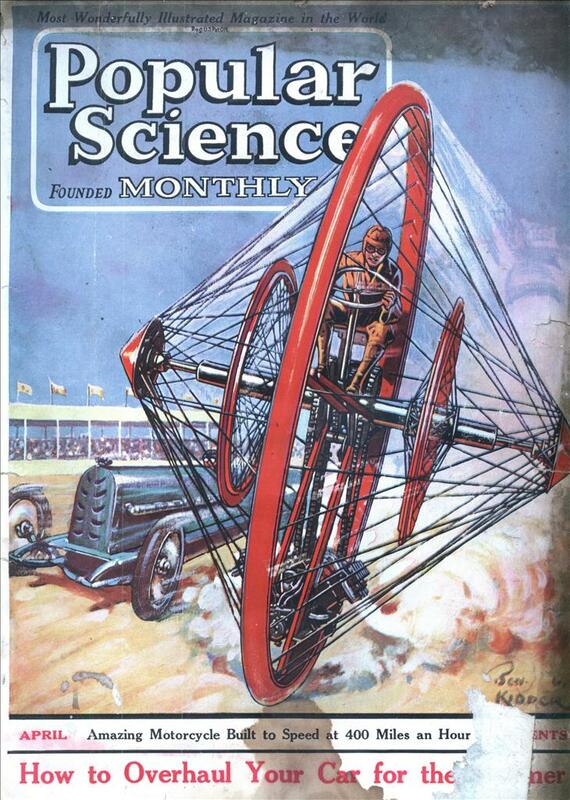 Ask your newsdealer today to save your copy of POPULAR SCIENCE MONTHLY for May. Thanks so much for your work in selecting and re-circulating such old gems as this one! i need to know EXACTl how the earth was formed!!! dont care how long it takes u i want to know it, i will pay anyone 430,000 dollars if you can figure it out!!!! gogogo!!! !